Hey there! Thanks for dropping by luminous wordpress! Take a look around and grab the RSS feed to stay updated. See you around! 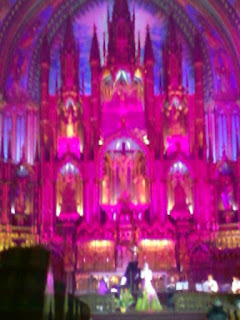 Dubbed as “the voice that will conquer your soul” she delivered on all fronts in the most veneered of all surroundings: the Notre-Dame de Montreal Basilica (that we simply dub “La Basilique” of course) in an altruistic compassionate élan for this was not only her first concert for a Canadian audience but it was also a benefit concert for the Children’s Center Mechta (mechta meaning dream.) And this just as the concert was dedicated to World War II veterans as well. We were there and, despite the distance of our seats and the lighting being not quite favorable to that, we could take some snap shots with the old cell phone if only to illustrate this humble review; now, resolution is never close to perfection with such photography but it will give you an idea of the spectacular mise en scène that surrounded the soul-conquering voice on that magical concert evening…! She graduated from the Musical College of Rimskiy-Korsakov as a classical singer and then continued her higher professional education in the Theater Arts Academy on the department of the Musical Theater. She started to give her first solo performances when she still studied at the second grade of the Musical College. Later she got the first price at the Francophone competition as the song writer for the songs that she composed and performed in French languages. So her first international concerts started in France. There is no doubt, her vocal range impresses more than one professional of the same field and certainly captivates all music-lover’s heart with her unique way to perform that touches the cords of the soul. Natalia Orlova can employ almost every vocal genres like classical operatic arias, the beautiful Russian folk songs, jazz, chanson, classic romances or romantic ballads of her personal composition. Наталья Орлова – as her name is truly spelled in her mother tongue – has got an angelic voice indeed. Her demeanor is that of a natural diva too; the way she made her entrance was veritably flamboyant as she walked down the main aisle at the perfect pace, carefully placing each step forward, advancing towards the improvised stage, so as to set the atmosphere for the entire evening which she handled masterfully indeed. She alternated between classical and lyrical with ease and, after each piece, rousing applause and a few floral bouquets were only fitting as well as entirely required – for the souls of the audience had indeed been conquered by that time! 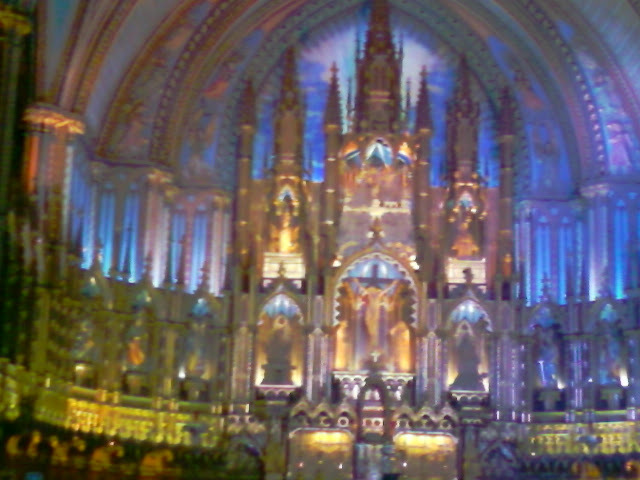 The lights illuminating the Basilique were alternating between colors most befitting of each piece and it all added to the magical atmosphere already permeating the august walls. 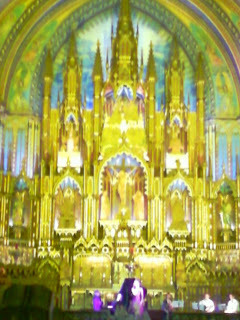 With the aid of five local musicians (including the Basilica’s own organ player) Natalia Orlova truly enchanted her audience. The piano, guitar, balalaica and violin only accentuated that enchantment – all instruments perfectly mastered by their respective musician, each so honored to be a part of the event. So many memorable renditions and pieces: from Novikov’s Nightingales to Zubov’s “Don’t Go Away” – from McCrae’s “In Flanders’ Field” to Schubert’s classical aria “Ave Maria”…! And her own creation too: Natalia Orlova’s own “Birch Tree” – do sample that one in particular on her website, you will be enchanted! Her singing, heartfelt commentary between two songs and the all-around aura about her tell of a diva different from other divas: one who believes in God sincerely, knows it is a great Gift from Him that she received to be so musically gifted and one who realizes that she has the role, in effect, to bridge the gap between Heaven and Earth with this talent for music. 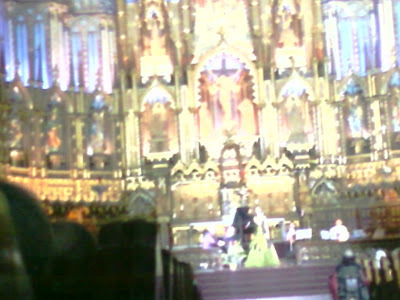 Her special care and attention to focus upon the souls of the departed soldiers, right from the onset of the concert, was especially touching as much as it was à propos for us here on the TLB Prime Network – even more so, we could say, than her nice gesture to include her magnificent rendition of “ô Canada” as her finale for the evening! Verily, it was another admirable gesture on her part. Oui, Je me souviendrai toujours… du concert “Je Me Souviens… From Russia With Love” de la DIVA de St-Pétersburg, Natalia Orlova! Make sure that you click on each and every picture for a few extras both about the concert as from the diva herself. Spaciba! Spaciba, Natalia – for having uploaded these two videos of thy wonderful concert for all to enjoy, on YouTube! We Wish You… A Luminous Year!